Despite having only seen a small amount of the BBC’s Sherlock, I’ve always been a fan of detective fiction, especially the gentleman from Baker Street. Which is why, whenever I get asked a particularly tricky research question, I relish the chance to dig deep and get an answer. One of the great strengths of my team here at MoAD is that we’re all, at least in part, sleuths. Part of our job is to find answers to questions we never guessed anyone would ask. My favourite questions so far, in my decade here, have been: who was the tallest prime minister (Whitlam, by half an inch), which prime ministers were/are left-handed (only Tony Abbott, although Fadden might have been) and the one this blog is about: why does the prime minister sit at the central table in the House of Representatives chamber? Seemed simple enough. There must be a reason, right? Technically it’s the most senior minister who sits there; when the PM isn’t in the chamber, that seat is occupied by whoever is rostered on for that sitting. But when the prime minister arrives, that is where they sit. But why? To begin with, I looked to see which other prime ministers in Westminster systems around the world sit at the central table. I looked at photos and video footage of the parliaments of Canada, Jamaica, St Kitts, New Zealand, Britain, and others. And it turns out, only the Australian prime minister has a seat at the table. In Canada, India and New Zealand, among others, the prime minister sits at a desk, along the front row with his or her ministers. In the United Kingdom, the PM sits on the front bench along with the ministers, but without a desk. This is also the practice in New South Wales, where the premier sits shoulder-to-shoulder with her cabinet. In all the other states and territories, the premier or chief minister has a desk. The only exception: Victoria. The Premier of Victoria sits at a central table. The chamber of the Legislative Assembly, Melbourne, in 1896. The Premier, George Turner, is speaking from the table, where he has been sitting. The Premier still sits at the table today, uniquely among his counterparts in the other states and territories. It seems Edmund Barton, as prime minister, copied this tradition for himself. Image: State Library of Victoria. This got me thinking about the why of it all. 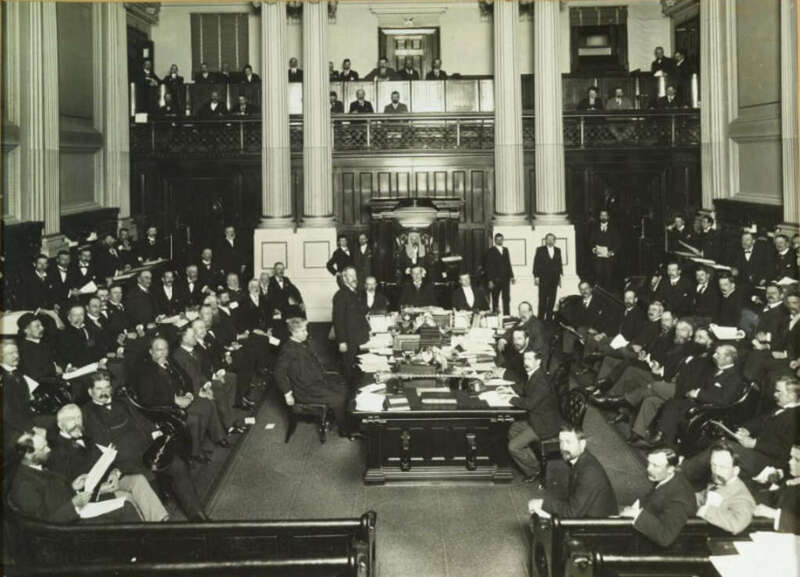 The Commonwealth Parliament sat in Parliament House, Melbourne, from 1901 to 1927. 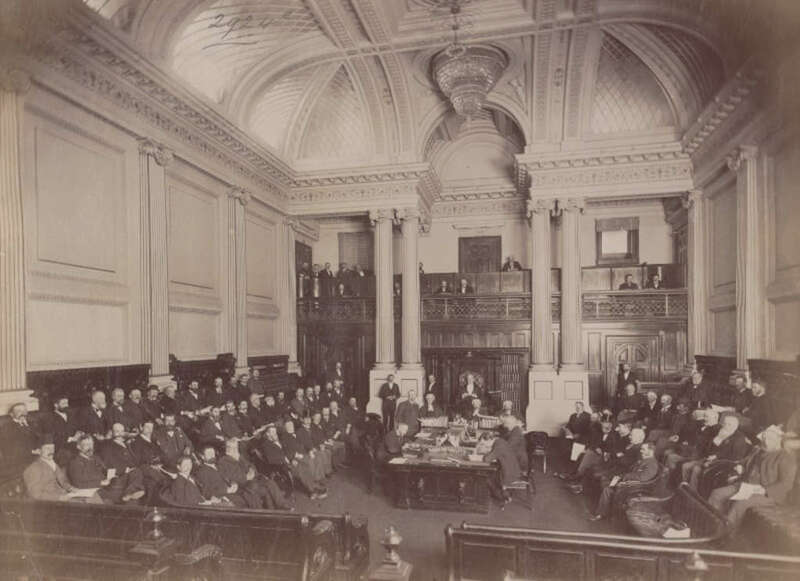 And in photographs taken of the House of Representatives in session, right from the first sitting the prime minister, and leader of the opposition, are seated at a table, opposite one another. Could it, perhaps, be that they copied the Victorian practice? A clue! I initially thought perhaps this was something done specifically in Old Parliament House, but the Victorian situation threw that idea out. OK, we have something to go on. If we assume Edmund Barton took a seat at the central table because that’s where the state premier had sat until then, we have a new question to answer. Why did the premier sit there? Five years later, and the Victorian Legislative Assembly was being used to house the new Commonwealth House of Representatives. 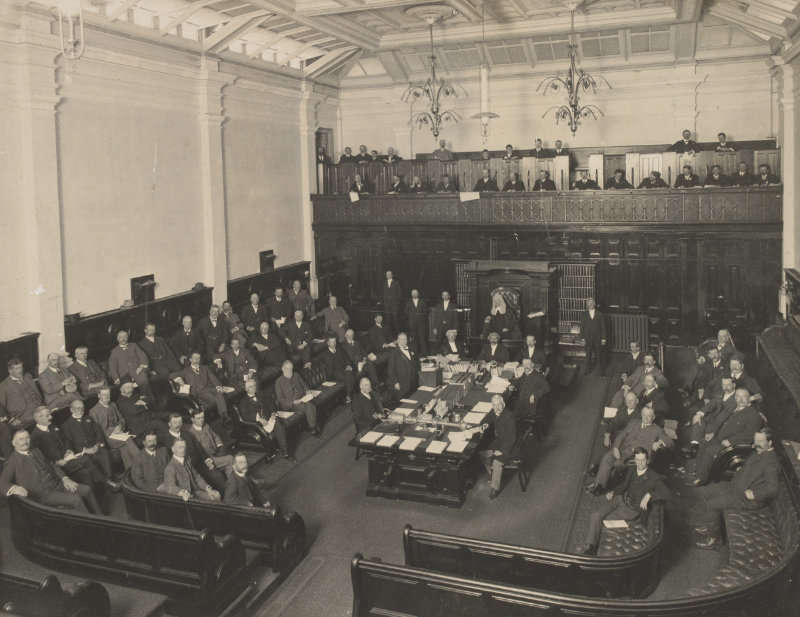 Edmund Barton and George Reid are both seated at the central table. Every Prime Minister has done so. Image: National Library of Australia. Armed with this clue, I set about finding the answer to the new question. Unfortunately, it wasn’t that simple. The helpful but apologetic researcher at the Victorian Parliamentary Library could not say. Neither could the Parliamentary Library at Parliament House. Neither did a book on the history of the Parliament House in Melbourne. So far as anyone knew, the premier sits at the table…just because. But for whatever reason, it seems as if Edmund Barton copied the practice, which remains today. While their building was taken over by their federal counterparts, the Victorian Parliament moved to the Royal Exhibition Building in Carlton Gardens. The Premier, continued to sit at the central table in the new chamber, so clearly it had nothing to do with the physical environment. This photograph dates from 1908. Image: State Library of Victoria. This was a disappointing result. I’d set out to find the answer, but all I had was more questions. However, the research journey I went on wasn’t a dead loss. I was able to learn quite a lot about the chambers and processes of parliaments around the world. 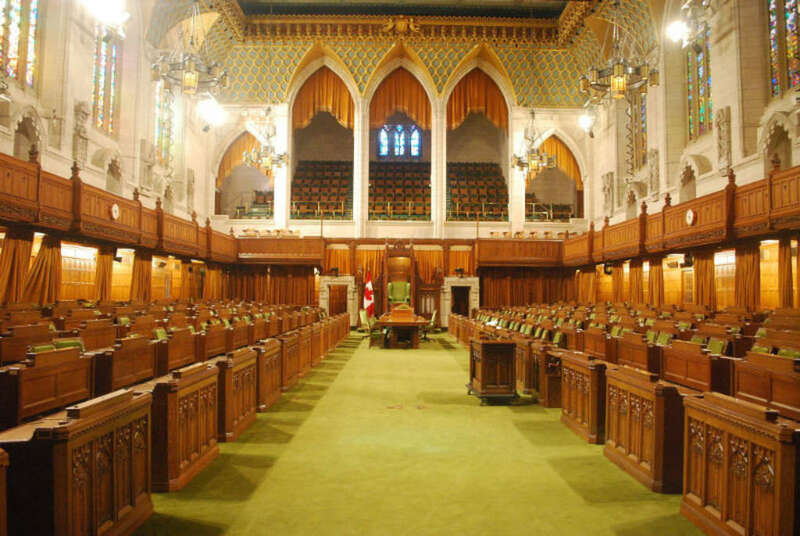 Most parliamentary chambers are semicircular, or horseshoe-shaped. This echoes assemblies in ancient Greece, which were often held in circular amphitheatres. 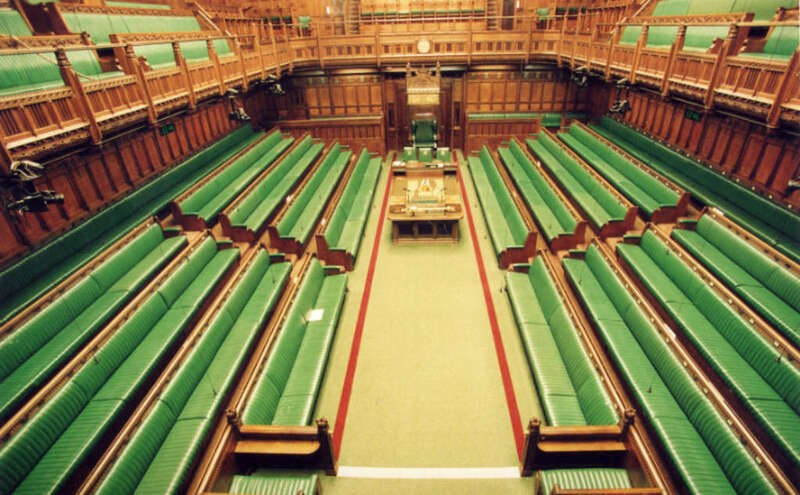 The English, and later British, House of Commons has rows of benches facing each other, but most modern Westminster parliaments follow the horseshoe shape. In the House of Commons in Westminster, there is a central table, and ministers rise to speak from it but all of them, prime minister included, sit on the front bench. The oblong shape of the room and its seating has not been copied by many parliaments since, most of which have a horseshoe shape. Image: UK Parliament, published under Creative Commons. Exceptions include Canada, and Jamaica, but both of those have desks installed for ministers. Britain and Australia both have ministers sit on the front bench, deskless, and move to the Despatch Box when it is their time to speak. The horseshoe shape is also present in France, the United States and Germany, among many others. One school of thought says the shape promotes a more collegial, less antagonistic approach to lawmaking. The Canadian House of Commons, modelled to some degree on Westminster, has a central table, but the Prime Minister of Canada and his ministers all sit on the front bench, rising to speak from desks. Image: Wikimedia Commons. As for the central table, almost all Westminster parliaments have one, or something like it. Canada, Britain, India, Jamaica and New Zealand all use one, although the people who sit at it are Hansard staff and parliamentary officers only. Some other legislatures, like the U.S. House of Representatives, have a podium at the front, from which members speak. One feature every parliament or legislature does have in common is the position occupied by its presiding officer. In Australia, the Speaker sits in a fairly ornate chair, while in America, the Speaker’s seat is on a fairly high platform. 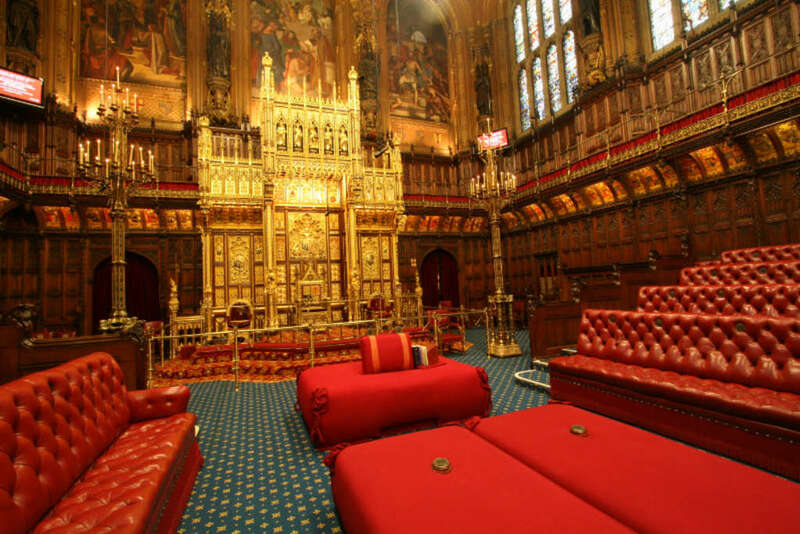 My favourite presiding officer’s chair is the Woolsack in the House of Lords, which is basically a cushion at the foot of the throne. The Woolsack in the House of Lords is unusual for the chair of a presiding officer. The Lord Speaker (or the Lord Chancellor before 2005) sits on a cushion, with the throne behind them. Image: UK Parliament, published under Creative Commons. Parliaments may come in all shapes and sizes, but Australia’s has its own uniqueness. Only here, it seems, does the prime minister sit at a table separate from his or her colleagues. Why? If only Edmund Barton were alive. I could ask him. Addendum: As it turns out, there is one other Australian leader who sits at a central table. The ACT Chief Minister, and Opposition Leader, have done so since the Assembly was enlarged in 2016. Thanks to alert reader Tim Cooke for spotting this. 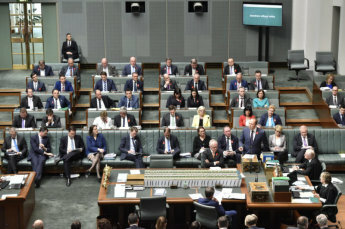 Australia’s prime minister, and his opposition counterpart, always sit at the table in the House of Representatives, with their front bench colleagues behind them. But why? Image: DPS AUSPIC.